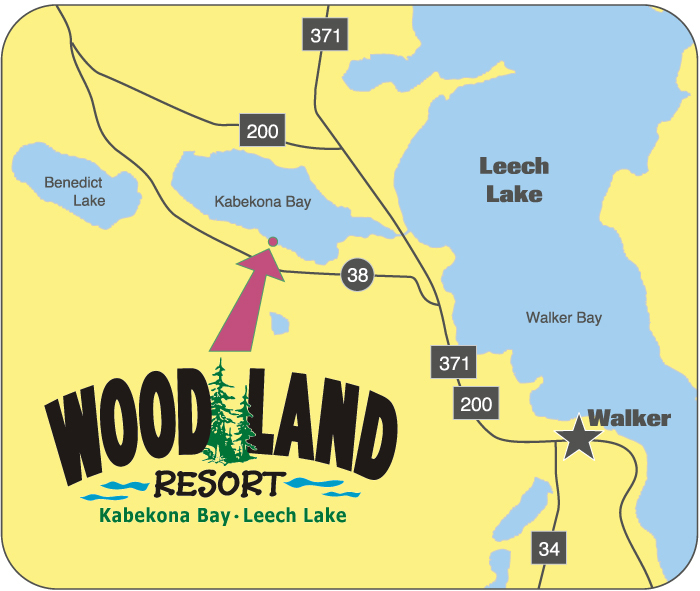 Woodland Resort is located just 4 miles north of Walker, Minnesota. From downtown Walker, go north on Hwy. 371 for 2 miles to Kabekona Bay Road (There will be a green sign on the right hand side of the road). Take a left onto Kabekona Bay Road, also Cass County 38, and we are 2 miles up on the right. Coming from Minneapolis/St. Paul, take 94W for 49 miles to MN-15 N via Exit 167B toward St. Cloud. Stay on Hwy. 15 for 9 miles, then merge onto US-10W for 28 miles. Merge onto MN-371 N toward Brainerd. Stay on 371 for 81 miles to the 371/200 Junction (Northern Lights Casino Intersection). Take left onto 371/200, 5 miles to Walker. Coming from Duluth, take MN I-194W. 194 turns into US-2 W. Go 35 miles to Hwy. 200. Stay on 200 for 80 miles, to Downtown Walker.